As a child (or young adult), I never cooked. I didn’t know how to. I could rustle up a decent cup of instant coffee but that was it. Mummy tried her best to get me to help around the kitchen, perhaps learn to cook a few basic things. But I wasn’t remotely interested. Mummy, smart and wise woman that she is, gave up on the obvious to-be-wasted effort. Her thought? You will learn to cook when you need to. I arrived in the United States, a young and hopeful bride, hopelessly earnest and wondering/wandering. And I had to get cooking. So I learned quick on the job. Some blogger friends may recall old posts where I describe cooking moong dal, or what I thought was moong dal but ended up being masoor instead. I used to call P at work, asking him to “troubleshoot” difficult cooking situations. Ahhh, those were the days. 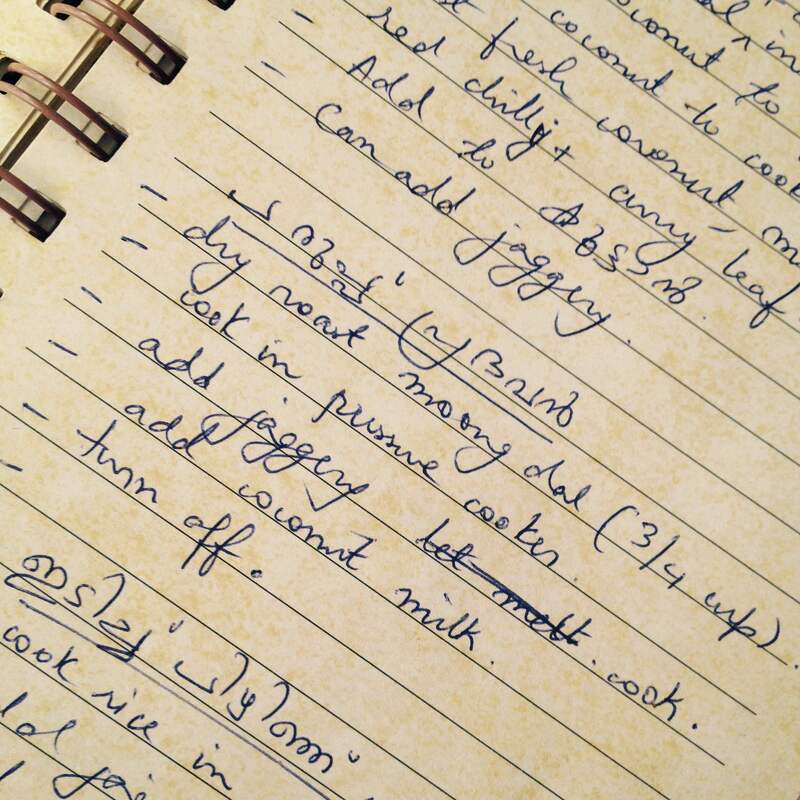 That was the time I began maintaining a notebook of recipes I got from my mother. And that’s how I got hold of the Parippu Pradaman recipe. 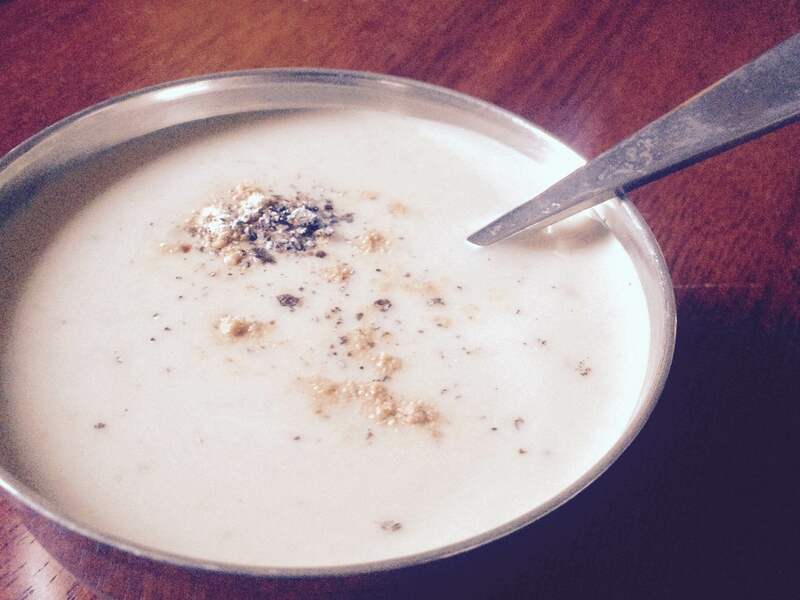 This is a traditional Kerala dessert, made from moong dal, jaggery and coconut milk. Yes, it is vegan. And it is ready in minutes, if you use canned coconut milk. You can fancify this dish with raisins and toasted cashew pieces, if you like. I prefer the simple version, so here goes. Roast moong dal in a flat pan until lightly toasted. Let cool. Wash the dal with water, rinsing thoroughly. Cook moong dal in a pressure cooker, or on the stovetop in a pan. Using the back of a spoon (or a potato masher), mash the cooked dal to remove lumps and gain a uniform consistency. Place jaggery in a pan. Add boiling water, mix evenly. Cook on medium-low heat until the jaggery melts into a syrup consistency. Add moong dal to the jaggery syrup. Mix thoroughly. Add coconut milk. Turn off the heat. Add more (or less) coconut milk to get the desired consistency. Remember, coconut milk adds sweetness, so adjust the amount of jaggery accordingly. I cook lunch and dinner on most days. P and I take lunch to work in Thermos containers that keep the food warm for hours. A long time ago (or so it seems), I used to cook extra food for dinner, and we took the leftovers for lunch the following day. Then something changed (and I don’t recall what it is). I began cooking lunch every morning. We discovered that Thermos containers are true to their word. The steaming dal blew my mind (and P’s too). We were instant converts. Now I cannot fathom eating leftovers for lunch. There is clearly something to be said for the sheer deliciousness that is freshly cooked food. There is a certain juiciness to it, an indescribable rasa that renders the food sublime and delicious and utterly satisfying. You’d think that a kitchen as heavily used as ours would see a high turnover of ingredients and supplies. That’s certainly true for some varieties of dals and beans, fresh produce, bread, avocados, dates (we seem to consume them in crazy quantities, we do), etc. However, there are certain ingredients that lurk on pantry and freezer shelves for a long while. So I have decided to start using those “silent actors” and clear them out. Made a delicious Spiced Banana Loaf yesterday. Proud to say that I cleaned out the following items for this endeavor: spelt flour, almond meal, broken cashews. I also used white whole wheat flour that has been sitting in the freezer for a while now. This is a vegan recipe that uses coconut oil. I use the organic, unrefined type of coconut oil and it is fairly flavorless. The original recipe called for 1.5 cups of chocolate chips but I used a blend of cranberries, black raisins, cashews and cocoa nibs instead. Can I just say that mix is a whole lot more interesting than plain old chocolate chips? The end result was moist, mildly sweet (I used a third of the quantity of sugar mentioned in the original recipe), perfectly spiced. I couldn’t carve out neat slices, instead ending up with little misshapen slabs. 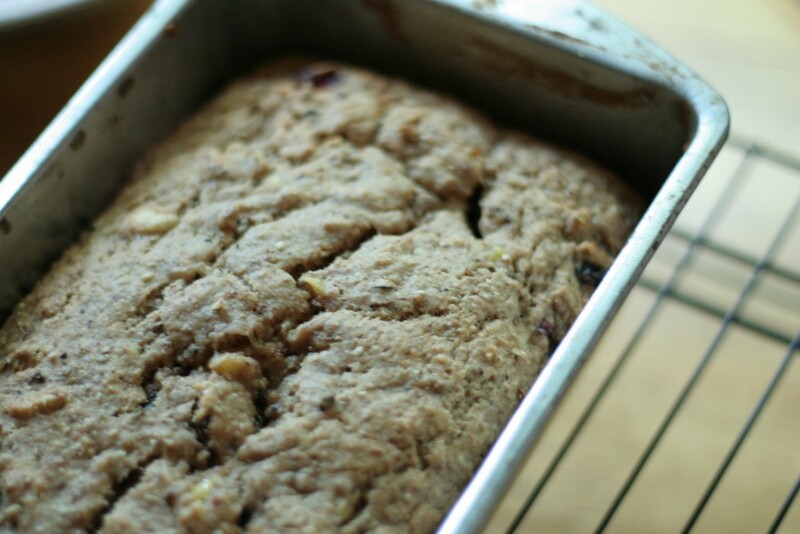 The original recipe is at NY Times Cooking – Vegan Chocolate Chip Banana Cake. In a large bowl, whisk together flour, sugar, baking powder, baking soda, salt, cinnamon, nutmeg, cloves and ginger. In a separate bowl, whisk together bananas, coconut milk, oil, vinegar and vanilla. Pour the wet mixture into the dry mixture and whisk until just combined. Fold in the dried fruit and nut and cocoa nibs mix. Stir well. Preheat the oven to 350 F. Grease a loaf pan. Spread the batter evenly into the prepared loaf pan. Bake for about 50 to 55 minutes, until a toothpick inserted in the center of the loaf comes out clean with a few crumbs clinging to it. Transfer on to a cooling rack. Carefully turn it over, so the bottom does not get too moist.